Dec. 4, 1948 was a day of firsts for the University of Alabama and Auburn University: The teams hadn’t played each other for 41 years. It was the first Iron Bowl at Legion Field; and the Tide defeated the Tigers with the largest margin of victory in series history, 55-0. The rivalry was suspended in 1901 because of issues related to player per diems and where to find officials. In 1947, the Alabama House of Representatives passed a resolution encouraging the universities to “make possible the inauguration of a full athletic program between the two schools.” The resolution didn’t have the effect of law, and both schools were disinclined to resume the series. The Legislature threatened to withhold state funding unless the rivalry renewed, convincing then-Alabama President John Gallalee and then-Auburn President Ralph Draughon to end the disagreement. 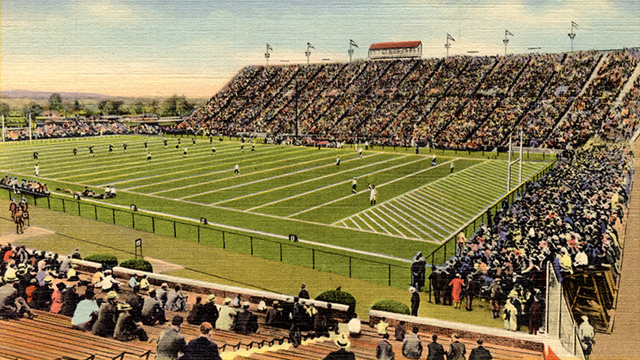 They agreed that the games would be played as a neutral site series in Birmingham, home to Legion Field, which was the state’s largest stadium at that time. Alabama refused to travel to Auburn, citing poor roads and the small size of Hare Stadium. The series eventually moved out of Legion Field, and the game now alternates between both schools’ campus stadiums.